I’ve probably never mentioned it before, but I am a gamer. I love games. Board games of various shapes and sizes, card games, pen & paper RPG, computer games, video games (old school for Arcade/Console), all of that. Now, for those in the know, there’s this thing going on that has dubbed itself #GamerGate thanks to a twit by the ever lovable (said with dripping sarcasm, though I do adore him as Jayne, I just hate that he didn’t have to act for the part) Adam Baldwin dubbing it so. And right about then was when things really went to Hell in a handbasket, frankly. Long story short there’s a not so great game out there about depression. It’s around for a couple years, and due to not being all that exceptional it was a little surprising when it suddenly gets a lot of attention. Whatever, it happens. Well, an ex-boyfriend (“ex” being an old Latin prefix that means “do not to trust this person as an accurate primary source of information”) said it came from her shagging a game reviewer. So, ostensibly, the whole thing is about journalistic integrity and ethics in journalism. Except it really isn’t. Not in practice. 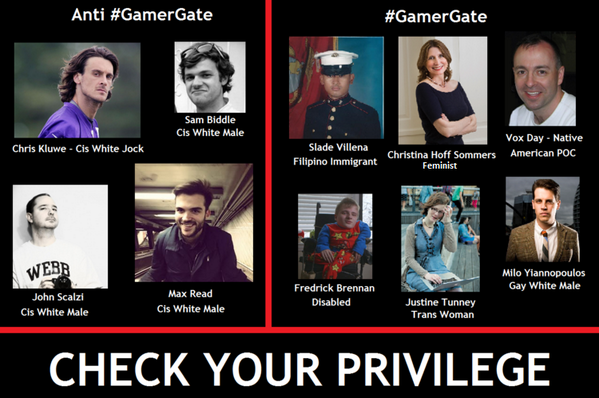 Now, in it’s intent, I have no problem with #GamerGate. Really, on paper, it’s fine. I agree with it, even. And not just gaming journalism, just journalism in general. I mean, has anyone seen the statistic on the number of inaccuracies in Fox News, CNN, MSNBC, etc? Appalling! In practice and reality I loathe, oppose, and deride #GamerGate. Because of the reality. The reality is that before it had a name it was, as far as the most active adherents, people personally attacking the person who wrote the game, publicising her private information (aka “doxxing” though I’ll be buggered to know why), and threatening violence. Yeah, real mature, folks. Then it gets a name, and it’s being used to lob horrible things at women involved in gaming in any fashion. Even the sweet, quirky, Ms Felicia Day was not immune. Here’s the thing, it’s kind of like feminism except this one has actually managed to go too far; most feminists aren’t really like the Womynists on PCU (though some are), and feminism is able to keep the strongest spotlights on the sane & rational people like Ms Emma Watson. #GamerGate, on the other hand … no, you have the people who make Adam Baldwin and his character Jayne look sweet, thoughtful, empathic, and cuddly. If you support the ethics in journalism part but not the misogyny, threats, etc. You need to dissociate from #GamerGate. The trolls have taken over and are entrenched. Anything you say or do now in support of it is seen by those around you as being in support of the hate and psychotic behaviour. It also doesn’t help that a lot of people trying to defend it do so in a very misogynist, racist, and/or hateful/trollish fashion. My dear readers, I will not even repeat a sampling of what is being said by the GamerGaters, I won’t. I’ve had precious little to eat this morning, and would like not to vomit it back up; also I am, ostensibly, a lady and … just … sick. It’s sick. Really, I give even a strong constitution 50/50 odds of becoming ill in the first 3minutes of exploring “GamerGate” on either Google or Twitter. It’s the thing with causes. An ideology can be usurped by the insane. If the insane get enough attention, then your ideology is tainted by this. This doesn’t mean abandon the cause, nor to abandon the ideology, it does mean you should distance yourself. Some fights aren’t worth fighting, some fights are lost before they’re begun. The first thing I’ll say is, with any cause and any ideology you’ll have a psychotic fringe element, fight to keep them off the Television (figuratively and literally – it’s like southerners and that woman in the mumu and sponge rollers Jeff Foxworthy mentions in his act); if you lose that fight … Well, the thing is, sometimes you need to fight to establish a new name after you assess where things went wrong to try to avoid the same in the future. Your fight, too, is now harder, because now you do have to be careful how you defend yourself. At first doesn’t seem too bad. But some things that I know would be attacked: First and most important is the extraordinary number of women, non-whites, and LGBT who are vehemently opposed to GamerGate and have VERY publicly said so (this woman, being among that list). Secondly would be the fact that someone is going to point out that they chose six people who, at least by the photos selected, could pass for white, not to mention only two people aren’t. Finally, “Disabled” is not a sexuality, a gender identity, nor a race. It’s an almost decent effort, but it’d be picked apart (and has been, though I’m in no mood to look for the links). While it may be true that you can win back a cause and a name through diligent fighting off of the trolls, and the rational clawing their way into the spotlight and refusing to relinquish it to the nutjobs, you’re not going to do that by being a troll yourself only with better spelling and grammar. You’re also not going to do that when, while already being taken anything but seriously, you defend yourself with information that it would take less than a nanosecond to see was incorrect just by the person looking up or down from your post (given that this is largely happening on Twitter) and seeing all the NOT cisgender white men attacking it. Also you need to not just say “it’s not about misogyny”, if that’s the case then you need to stop reacting to the ant-#GamerGaters exclusively, you need to also react to the misogynists and racists, you need to acknowledge that we have a point. We’re willing to concede to you that ethical journalism is important; we might point out that it’s actually a very small statistical sampling of online game reviewers who seem guilty of any unethical behaviour, though it’s pretty true elsewhere, but we concede the ideology without reservation — how about, now, you acknowledge that manly men can say as they like about #GamerGate but not so manly men or any woman can’t say a damned thing without being attacked. Hell, some didn’t even know #GamerGate existed before she was being attacked by #GamerGaters. In the 60s’ civil rights movement there were many blacks who criticised the Black Panthers and Malcom X (In Malcom’s defense, he did come around to a more Dr King look at things, I refer to when he first came on the scene). In the feminist movement there are many ladies who will tell off a rad-fem woman for her extremism. Even the male rights activists have a point! except that they haven’t managed to chisel out from under the fact that the movement seems (and please, anyone better acquainted with the history correct me if I’m wrong) to have been founded by the grunting apeman sort of guys which doesn’t much help the point for the ones who do have something worthwhile to say. In its current form #GamerGate is bad. It’s a cesspool of hatred, misogyny, racism, homophobia, transphobia, anti-feminism, and a lot of other not-so-kosher things. Is there Truth and sense in there? Yes. Is it the majority being drown out by a vocal minority or is it a trollish majority being defended by a rational minority? Far as I can tell, the latter and all too often “rational” is being a little generous. I’ve got rambly, I’m sorry. Thing is, whatever you fight for, you cannot defend it blindly. Blind patriotism, blind environmentalism, blind feminism, blind anything, is blind. It’s handicapped, and it’s (pardon the pun) shortsighted. If you wish for the reality of a thing and its intent to remain aligned you have to fight your extremist supporters, those who hurt you with their support. I tend to applaud people, like the CEO of Starbucks, who tell people they disagree with to take their money elsewhere – they’re business people, but they feel that principals are more important than money, bravo! Greenpeace, PETA, etc. they have good points, they do good work, that doesn’t mean they’re always right and every action done by them or in their name or in the name of a cause they support is right and good and noble. #GamerGate is, in the end, just one more example of it not mattering one whit what you mean, if what people see and perceive is something else. Reality is, in large part, perception. Dr King is criticised for elevating Rosa Parks over an unwed, pregnant teen girl who’d done the same thing around the same time … because image matters, that unwed girl with a pregnant belly would have hurt his point because people would have got hung up on how horrible she was and missed the message. Just as that graphic above doesn’t help, because it has too many flaws that people will be paying more attention to than the point it tries to make. Our actions, our words, they define us. We must balance Good Cause with Wise Action; we have to balance Good Idea with Reasoned Statements. Remember, those journalists, those coders, they’re human beings. First that means they have feelings. This doesn’t mean don’t criticise them, but it does mean that you shouldn’t treat them as some practice dummy in a medieval training ground, there for you to hack and slash at with impunity. We’re all people. We all have lives, we all make mistakes, we all have feelings. I’m sure the people doxxing Felicia Day and calling her such horrible things, wouldn’t be too happy to have the same medicine dosed on them; “Do unto others …” hast many a wise man said, after all. You seem to be advocating for the decent folk in GamerGate to give up because the name has been tainted by the hordes of misogynists, racists, and trolls. How are we supposed to fight off that element and take the cause back if we give up on it? Rebrand? Those very same idiots will follow us no matter where we go or what we call it because they have their own disgusting agenda, and unfortunately they are in the gaming community. You make some excellent points and I agree with a lot of what you’re saying but I don’t see a logical route to take that won’t attract these people. It’s the internet. If there were a way to quarantine these neanderthals it would’ve been done on day 2. When a large part of people’s outrage stems from site’s silencing the conversation it’s kind of difficult to silence these idiots without being guilty of the very same thing some people are angry about. Damned if you do, damned if you don’t. I’m nowhere near as militant on this issue as some people are and that’s mainly because I see a lot of the same problems in GamerGate that you do. What started as an issue with just a couple of specific outlets and a handful of people has turned into what amounts to a conspiracy theory about the entire industry. There are certainly problems that need addressing but until cooler heads prevail this is just going to be a giant mess of nasty. That’s up to the movement. Rebrand and, this time, take a strong stance against the trolls when they try to follow? Thing is that until cooler heads do prevail #GamerGate isn’t going to be repected or taken seriously. That’s absolutely right, given the current situation, it’s possible that the only way for cooler heads to be heard is to be standing on a different soap box. Personally, I’m not really thinking that a name bestowed by someone so notoriously homophobic, and misogynist as Adam Baldwin is all that wonderful an idea to carry on with in the first place.